We check out the all-new Cruisetec tire direct from Metzeler. Building a cruiser tire used to be a relatively easy task for a tire manufacturer. None of this labor-intensive R&D for cornering and handling that the sport tires require, just make sure that the ride is smooth with plenty of straight-line stability and that the center tread has a long life, and you pretty much had all the bases covered. The Metzelers fitted to the Indian Scout gave the chassis a chance to show its sporting potential. With the latest generation of cruisers taking over the market, that’s not the case anymore. The new breed of power cruisers no longer emphasize only straight-line brawn; now you need to have some handling and cornering prowess, while still maintaining a smooth ride and long tire life despite being subjected to heavy loads and extended highway miles. Metzeler saw this need coming a while back, and spent a considerable amount of time and resources to develop a new tire that would fulfill all the performance requirements of the modern cruiser, from the Harley Road King or Sport Glide rider who loves to run through the mountains, to the Indian Scout Bobber pilot who wants a tire that can handle the torque in the corners without going bald in the center at 5000 miles. Labeled the “Cruisetec,” Metzeler’s latest product incorporates the company’s extensive knowledge and latest technology to create a tire that can fulfill all the mission requirements of today’s heavyweight machinery. In order to build a tire that would handle all these roles, Metzeler first concentrated on the overall tread profile. 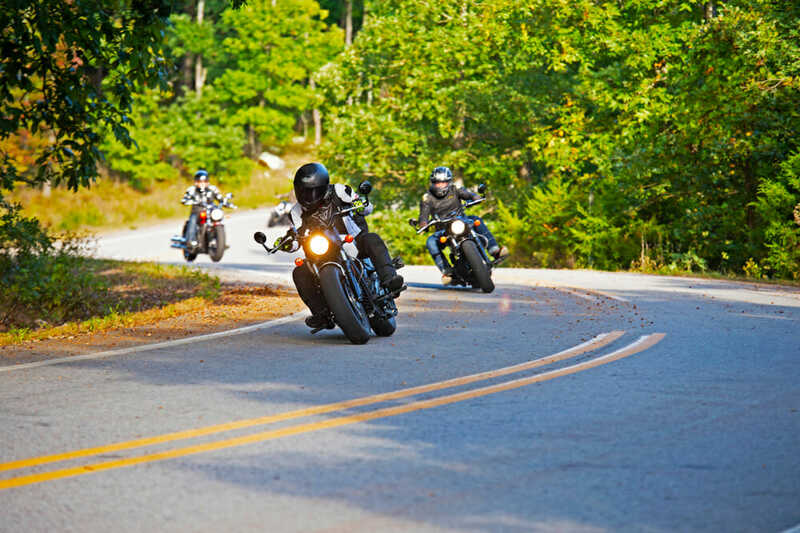 Because of their usual focus on straight-line stability and mileage, normal cruiser tires have a steep profile on the shoulders that results in a very large variation in footprint size (up to 18 percent according to Metzeler) as the tire leans into a turn. The Cruisetec has a more performance-oriented contour that has a much smoother transition from straight up to max lean (around 10 percent), resulting in a more consistent footprint that provides better steering precision and much improved feedback at various lean angles. 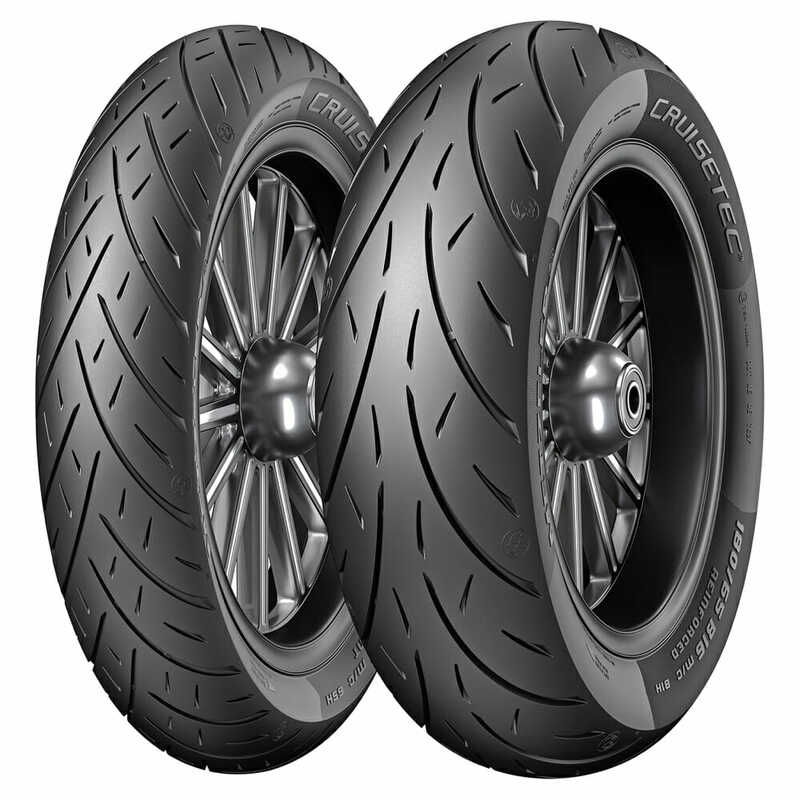 Obtaining long tire life along with grip and performance in the turns is a tricky combination to achieve, and like many manufacturers, Metzeler went with a dual-compound construction for the rear tire. But it didn’t just slap a harder compound in the middle and call it good. Due to the extra load stress a heavy cruiser places on a tire, finding the proper ratio of softer shoulder and harder center compounds is a difficult balancing act. The Cruisetec has about 35 percent of the tire profile’s center using the hard compound, yet the contact patch when upright still has more than 80 percent occupied by the longer-wearing rubber. The harder compound is also laid underneath the softer shoulder compound to provide support and prevent excessive flex and heat, resulting in more consistent wear over the life of the tire. The tread design is claimed to provide quick warm-up, instant turning response, and improved grip both during straight up and leaning situations. In order to support the heavy mass of a cruiser, typical tire construction for these bikes requires a pretty stout carcass with plenty of belts and cords, which normally results in a stiffer ride. Metzeler countered this by employing a lower cord count with stiffer cords in the belts than standard V-twin tires. This combination not only results in compliance that allows the tire to better conform to pavement inconsistencies for better grip, but it also permits more rubber into the tire carcass, improving damping characteristics over bumps and providing a more stable footprint at all lean angles. The payoff is less vagueness and more precise steering, including less wandering over rain grooves or pavement seams. The softer shoulder compounds (as well as the front Cruisetec, which is a single compound construction) utilize high-rated plasticizers and silica in their makeup to promote quick warm-up and much better grip in both dry and wet conditions. The tread pattern on the front Cruisetec features converging grooves along with diverging extension grooves. The design is claimed to provide quick warm-up, instant turning response, and improved grip both during straight up and leaning situations. 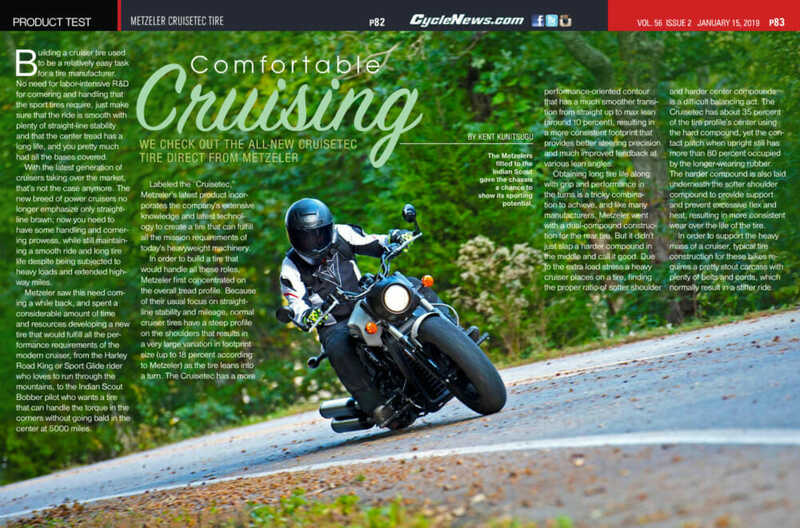 In emphasizing the grip aspect, Metzeler showed internal test figures that showed the Cruisetec stopping in less distance under wet conditions from 53 mph than all of its competitors. Meanwhile, the rear Cruisetec has a similar pattern, but with no grooves crossing the center, which Metzeler says promotes even wear. Both front and rear tread designs also contain bridges between the grooves to control tread deflection under extreme loads. Charging out of corners with the Scout’s big torque resulted in no traction theatrics, and heavy braking was never an issue. 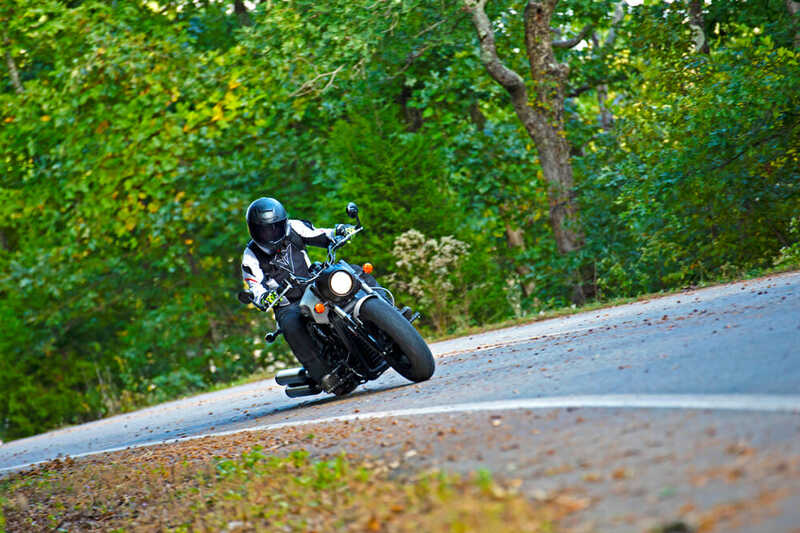 To prove the new Cruisetec’s performance, Metzeler invited the world’s motopress to Mount Magazine near Paris, Arkansas, in the Ozark Mountains. The mountain’s undulating roads would offer ample opportunity to test the Cruisetec’s cornering capabilities, while the valleys surrounding the mountain provided plenty of long straight sections of highway and byway to check out its overall ride quality. A good selection of cruisers from Harley-Davidson and Indian were on hand as test mules. My first test mule was a Harley Road King, and while the bike isn’t exactly a paradigm of power and performance, I spent enough time aboard it to get a good idea of the Cruisetec’s overall manners. Right off the bat, it was pretty easy to tell that the Metzeler was putting down a big footprint at both ends. There’s that sense of solid footing and feedback you get from a tire with a well-engineered contact patch, and the Cruisetec gives you that confidence—along with surprisingly light steering and agility. The ride was smooth over all manner of bumps, potholes, pavement cracks, etc., with little of the deflection that you often encounter with average tires, especially over rain grooves, where there was no wandering whatsoever. Cornering grip was excellent, although that was up to the point when the floorboards signaled that the cornering limit of the bike had been reached. 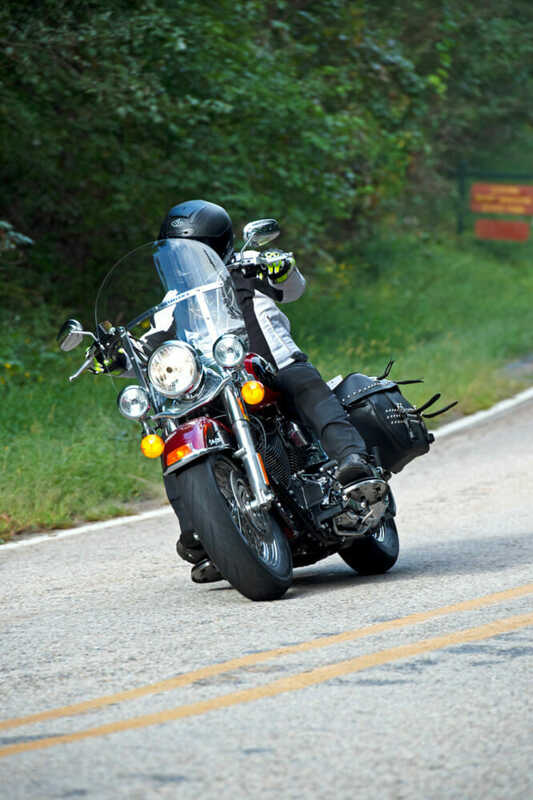 With the extra weight of the Road King, the Metzeler’s feedback and cornering prowess was excellent. It wasn’t until I got to throw a leg over an Indian Scout Bobber that I had the chance to really find out how well the Metzeler Cruisetec worked. The Indian has enough performance to push its tires, plus its seat wasn’t near as comfortable as the Harley’s, so ride smoothness was the first aspect that came to mind. In this area, the Cruisetec was superb, with just enough firmness to give the feedback necessary to understand what the tire contact patches were up to. But in the mountains was where the Metzeler shined with the Indian. Steering into the corners was fairly light but neutral all the way to max lean, and there was plenty of feedback even when the forward-mount pegs were scraping on the tarmac. Charging out of corners with the Scout’s big torque resulted in no traction theatrics, and heavy braking was never an issue. In short, there was nothing that left me wanting with the Cruisetec (of course, we didn’t spend enough time on the Metzelers to find out about their mileage—but given Metzeler’s reputation for long-wearing rubber, we wouldn’t doubt the Cruisetec’s abilities in this area).